Review “The Hopey Changey Thing” and “Sorry” (Timeline Theatre): I LOVE these Apples! TimeLine Theatre presents The Apple Family Plays; THAT HOPEY CHANGEY THING and SORRY. Nelson masterfully illustrates our nation’s political strife from a family’s perspective. Four adult siblings debate their democracy disillusionment. Although the liberal-minded family was raised democratic, the corruption of politicians on both sides is making each one reassess his/her allegiance. They discuss the governmental implosion and its impact on employment, heath care, education, the arts and the world’s opinion of Americans. And as the nation, along with their lifelong ideals, seems to be disintegrating and dividing under the weight of greed, they face another loss in the increasing dementia of their beloved uncle. Nelson makes us care about his characters. They are relatable. We see ourselves in these siblings. They argue, challenge, and ridicule each other. But most importantly they understand and accept each other’s differences. Their alliance is based on knowing each other’s true essences from sharing a childhood. 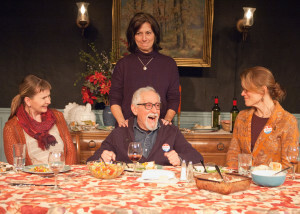 These plays are about family and the moments that divide and unite us. And Director Louis Contey skillfully makes this talented ensemble a family! Although each play is meant to be a stand-alone piece, I highly recommend seeing them both and in chronological order; HOPEY followed by SORRY. In HOPEY, the family gathers to discuss the failing health of Uncle Benjamin (played by the always delightful Mike Nussbaum). We observe the tensions of a family that has drifted apart. The steadfast Janet Ulrich Brooks (Barbara) has been taking care of the uncle at her home. Also a local in their childhood hometown, the animated Juliet Hart (Marian) has regularly helped her sister. The other siblings have been willfully obtuse. David Parkes (Richard) and Mechelle Moe (Jane) stay detached and distant from New York. When the magnanimous Parkes decides to ‘help’ uncle with a gift of a dog, Moe decides to tag along with her new boyfriend Tim (played by PJ Powers). HOPEY is a reunion of sorts as the siblings come to terms with the severity of the uncle’s illness. Their interactions have forced civility. Their conversations have underlying and unexplained hurt and disappointment. HOPEY has the siblings flesh out their new roles as adult siblings. SORRY is based two years later. It’s almost like an Act 2. We are invested in the Apples and now we get to see how they’ve resolved their family dysfunction. The good news is they are closer! The ridicule is more good-natured teasing. The arguing is over concern for the other’s well-being. The bad news is Uncle Benjamin has gotten worse. The family has some decisions to make. And they’ll make them together. What I love about Nelson’s writing is the layered and authentic storytelling. Nothing is simple and it’s all connected in intricate entanglements. First, there is an overarching political theme connected to a moment in USA history. Next, there is the family’s loving concern for a man who was both a respected celebrity and patriarch. And within that family story is each individual’s tales of careers, kids, and romances. Everybody has stuff going on. Everyone is flawed. This IS lives in progress. And it’s the honesty of the messiness of life and relationships that made me love these Apples. And after experiencing HOPEY and SORRY, I was ready for more Apples! I want Timeline to take on all 4 plays and have an Apple marathon with Contey directing this splendid crew of actors who very much resemble a tight, loving, imperfect family! For more reviews and information on Chicago theatre, visit Theatre in Chicago.